What kind of equipment/microphone do I need? Do I need to download anything to use SingSnap? Can I use a USB microphone to record? It keeps asking me to Allow my mic and camera, and won't let me record. Why do I hear my voice and no music on my recordings? Why is the music doubled when I preview my recording? Thank you for choosing SingSnap as your online karaoke entertainment! We are thrilled to have you and hope that you find your experience here to be exciting, friendly and fun! There is a lot to do here at SingSnap, but we know the reason you signed up was to SING! So, let us show you how easy it is to find, sing, record and save your first hit! Sitting proudly at the top of the site is the navigation panel. Each blue tab has a series of menu items, and we encourage you to click around and make yourself at home. For now, we will be working with the RECORD tab. Take note of the white words inside the light blue strip just under the tab. We have several ways for you to find the perfect song. Click on each to see what you can find! 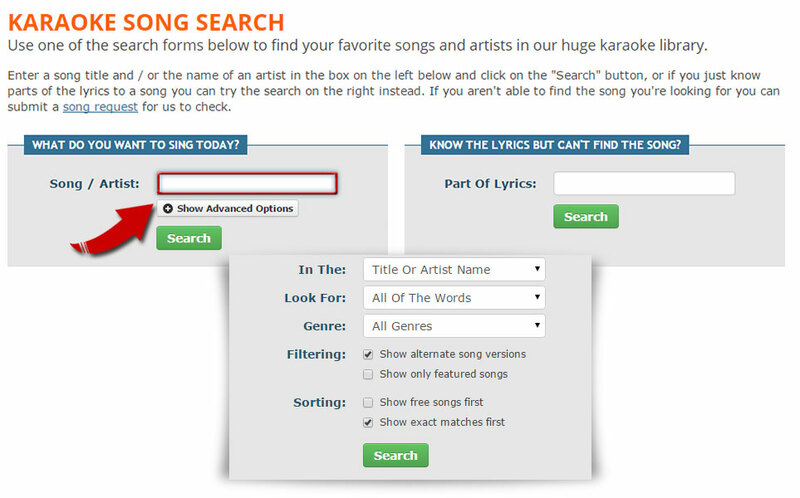 We'll work with the SEARCH page, but you can always use any of the options listed to find the perfect song. For now, click on the word SEARCH in the light blue menu bar beneath the RECORD tab. If you know the song you want to look for, enter some or all of the song title or artist name in the search box. If you want to refine your search, click on the Show Advanced Options button, and advanced options will open up for you to help narrow your search further. Click the SEARCH button to see the results. Once you have your search results, you can find your exact match in the results list. Use the page numbers at the bottom of the list, or the NEXT button, to view more matches that are available. You can click the small arrow button next to the song to hear a preview of the track. When you find the song you want to sing, click the RECORD link to the far right of the song title to open the Recorder. Make Note! You may be asked to run the Setup Wizard if this is your very first time recording. The Setup Wizard will give you onscreen prompts and guide you through the process of selecting your webcam and mic (webcam optional), as well as testing your computer and upload speeds. If you have any trouble or questions about the Setup Wizard you can contact us by sending a private message to SingSnapSupport. There are a lot of 'bits' to the recorder, but you will find it very easy once you know what each button and window is for. Lyric Window - This is where the lyrics to the song will appear so you can follow along. When you have finished recording your song, a Review This Recording button will show. Click on it to move to the next step. Progress Bar - The bar here will turn from gray to solid black when the song is completely loaded. While you are singing or recording, the indicator will move along the line showing your progress. You can click on the indicator and move back and forth to move forward and backward through the song during Play mode. Stop - use this to Stop and start over. Play - use this to play the song to practice along with. This will NOT record your song, simply play it. Pause - use this during the Play operation to pause the song. Full Screen - use this to enlarge the recorder to full screen. Record - use this when you are ready to record your song. Record Volume - The colored indicator will light up to let you know how soft or loud your microphone is registering. Use the lever to raise or lower the volume of your microphone. When you are singing at your loudest, the indicator should remain in the upper green area. It is all right for it to go into the red very briefly, but keeping it in the green will give you the best outcome. Mic Level Protection - When this box is checked, the recorder will automatically reduce your Record Volume if it detects clipping or distortion on your louder notes. Music Volume - Raise or lower this lever until the music you are hearing is at a comfortable level. Large Lyrics Window - If you would like to see the lyrics at a larger size, click on this to bring up a larger version of the recorder. Video Window - If you have elected to record with video, this is where the image from your camera will appear. Cameras - When you ran the wizard, you selected your camera sources. 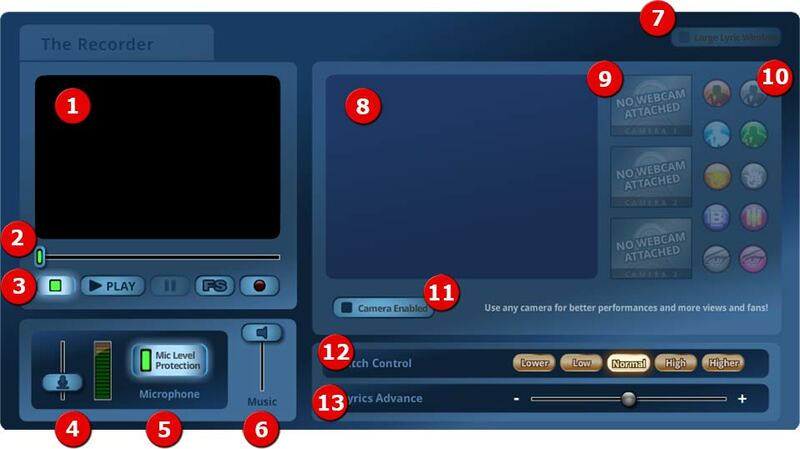 Here you can pick and choose, by clicking on the camera windows, which camera source to use for your video. Video Effects - Click one of these buttons to try out different video effects for your recordings. The button on the top left returns your video to normal mode. Camera Enabled - If you do not wish to record with video, be sure to click on this button to remove the green indicator. Clicking this button again will turn your camera back on for video recording. Pitch Control - This is a gold member option. If the song is too high, or too low for your range, you can use the buttons here to raise or lower the pitch of the song. Lyric Advance - This will speed up or slow down the speed of the lyrics in the window in the event they are moving too slow or fast for you to read them in time to the music. Once you have clicked the Review Your Recording button, you will be brought to the Mixer. Here you can preview your song before you save it and make any adjustments to the sync (the timing of vocals to music) as well as the volume of your vocals to the music, among other things. Lyrics/Video Window - If you have recorded using the video option, a preview of your video image will appear here. Using the large A button on the control panel will bring up the lyrics so you can check the timing. Progress Bar - The bar here will turn from gray to solid black when the song is completely loaded. While the song is playing back, the indicator will move along the line showing the progress. You can click on the indicator and move back and forth to move forward and backward through the song. Stop - use this button to stop the preview and return to the beginning. Play - use this button to start the preview. Pause - use this button to pause the recording without going back to the beginning. FS - this stands for Full Screen, but is disabled for preview. Show Lyrics - this large A button will toggle the visual display of the lyrics on or off. Volume Control - Move this slider up or down to increase or decrease the volume to a comfortable level. Enable Music - If you would like to hear how your vocals sound without the music backing track, click this box to remove the red checkmark. To return the music to the song, click it again to replace the red checkmark. Voice to Music Volume - If your vocals are being over powered by the backing track, move the slider button closer to the Voice side. If the music seems to be too soft, slide the button closer to the Music side. Timing Adjustment - If your voice is coming in too early or too late, use these adjustment buttons to move your voice forwards or backwards along the track. The small buttons move the vocals in smaller increments than the large ones. Make Me Sound Better - When checked this option will add compression and reverb to your finished recording giving it a bit more depth. Infinite Duet - When you duet with another member, and you have both recorded with video, this option will become available. Checking the box will bring both videos into the monitor side by side. Save This Recording - When you are happy with the mix you can click here to proceed to saving your recording. Clicking on the orange box with the arrows in it at the upper right will also proceed to saving your recording. You can use either option to save your recording. It's time to save your song. You have several options you can choose when saving your song. When you get to the save screen, you can elect to fill in some information about this particular recording. Open the Show Formatting Options box just above the text field to assist in formatting your information. You can also place code for a background image and other attributes here. If you need help with how to code a recording theme, please see our tutorials on BBCode. The next section is where you can take your "cover shot". If you elected not to use Video on your recording, this option will not be available. Simply pose for your picture and click the "Take Picture" button. Once done, the Save Picture Button will be activated. Be sure to save it! Next, you will want to decide what settings to save your song with. The Sharing option allows you to save your song Public (so anyone can view it), Private (only you can see it), or in a way that will allow you to share it only with those you choose. Click on the box to drop down all of the options. There are several more options you can choose by clicking the Show Deleted Recording Settings box. Additional options will open up below it. Slideshow - This option allows you to add a slideshow using your Picture Gallery. For more information see our Slideshow Tutorial. Allow Loves - This option determines whether you want to allow other members to be able to use the "Love It" button to add "loves" to your recording. 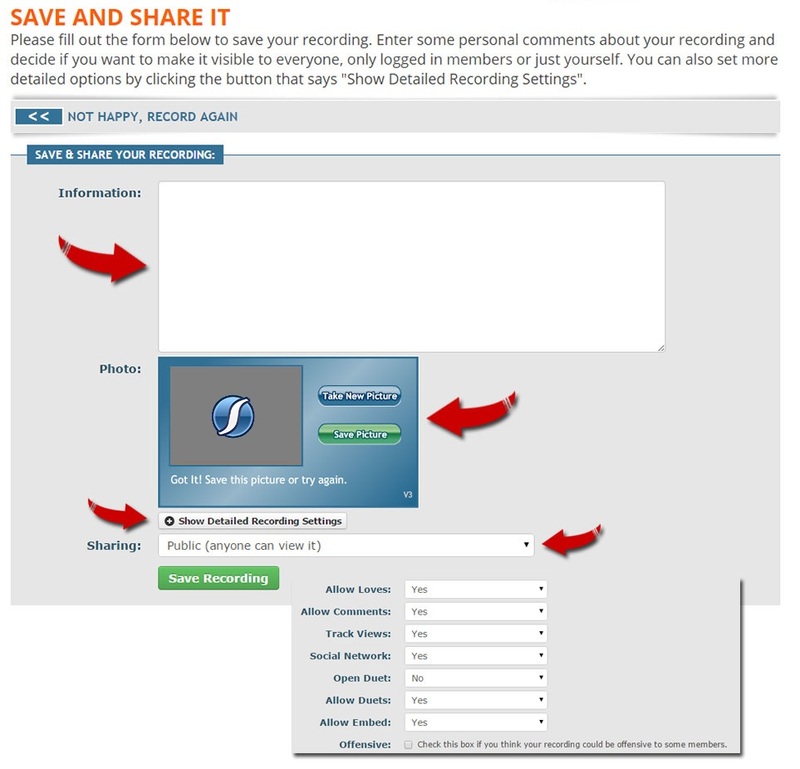 Allow Comments - This option determines whether you want to allow other members to comment on your recording. Track Views - This option determines whether you want the number of views on the song to be displayed. Social Network - This option determines whether you allow the social network sharing buttons to be displayed on your song. (i.e. Twitter, Facebook, Google+). Open Duet - This option marks the song as an Open Duet and places it on your Open Duets tab on your profile so others can find it more easily. Allow Duets - This option determines whether you allow others to use your recording to duet with. Allow Embed - This option determines whether you allow a full copy of your recording to be embedded on your profile, others' profiles, or anywhere on the web that allows the embed function. Offensive - SingSnap does carry songs with lyrics that may be objectionable to some. We ask that if you sing one of these songs, or if your recording can, in any way be deemed objectionable to some of our members, that you mark this option with a check mark. This helps us keep the site as family-friendly as possible. Click the Save Recording button. You're done! Sometimes it can take a few minutes for the song to completely save, but generally it is immediate. You can now review your recording again or edit it or the settings. You can always find your song by clicking on RECORDINGS in the navigation bar at the top of the site. All of your songs will be listed there. By default, they are listed by most recent first, but you can sort them by song title, artist, or the other available options by clicking on the white headings just above the list. Here we have tried to answer the most common questions we get when first starting out. You do not need to have any fancy equipment to record on SingSnap. Some people use headsets or built in mics, while others purchase expensive condenser mics. For the best recording experience, we do recommend a minimum of a simple microphone as well as headphones or ear buds. Using headphones instead of your speakers, will help avoid the music being picked up by the microphone and will give you a richer music sound without feedback. While USB mics can be used with SingSnap, you will find it difficult to hear yourself while you are singing with headphones as they do not provide a loop back to the listener. Lastly, you will see some mention external mixers. You can get a perfectly good sound without the user of this equipment, but if you are looking for a little more control over vocal effects, you can certainly invest in one, but it is not necessary. Yes, you must have the Adobe Flash Player installed on your computer. The Flash Player is a free download and can be found on Adobe's website. Yes, you can. When you record with SingSnap you have the option to "Enable Music" in the preview step of the recording process. When "Enable Music" is checked the voice track from your USB microphone will be mixed in with the music track. If you've clicked "Allow" and "Remember" in the popup permissions window and you're being prompted to allow permission again you may need to manually set the permissions. To manually allow mic and webcam access follow these steps. 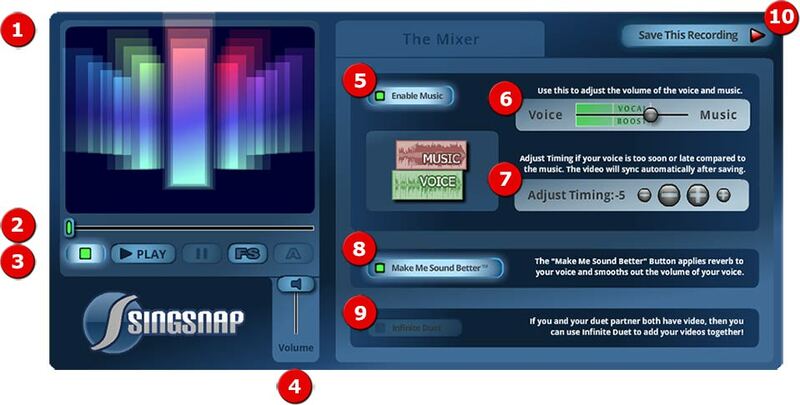 Open the SingSnap recorder or a saved song. Right mouse click on the recorder or song player. In the menu that opens click on "Global Settings..."
Click on the "Camera and Mic" tab at the top of the new window. Click on the "Camera and Microphone Setting by Site..." button. Locate and click "songs.singsnap.com" in the list of websites. Below the list of sites make sure "Allow" is selected in the drop down list. Close both windows and try to record again. Why do I hear my voice but no music on my recordings? You can remedy this by clicking "Enable Music" on the preview step to mix your voice and the music track together. Your sound card is set to record "Stereo Mix" or "What U Hear". This means that the music exists on your voice track and when you check "Enable Music" it will be mixed in once again causing the double track. Fix this by setting your sound card to record "Mic". You have set your sound card correctly but the music is being fed in to your microphone too loudly. This can be fixed simply by turning down the music volume when you record or better yet, use headphones.